Myproptree Foundations Pvt Ltd has developed a Independent House for sale in the name of My PropTree Ekanta , located in Mahabalipuram is developed as per Vastu at both in function and form. The project is sufficed with all basic amenities. Being close to all necessities, it has good connectivity to the rest of the city. Myproptree Foundations Pvt LTD has come up with 1 BHK Individual House in Chennai is built in traditional chettinadu style with all amenities surrounded. Arun Excello Ziva An Active Retirement Community, an Individual House is promoted by Arun Excello Realty Private Limited. It is located in Mahabalipuram, Chennai. The villa is surrounded by major school, colleges, banks, financial sectors, Gym and more. 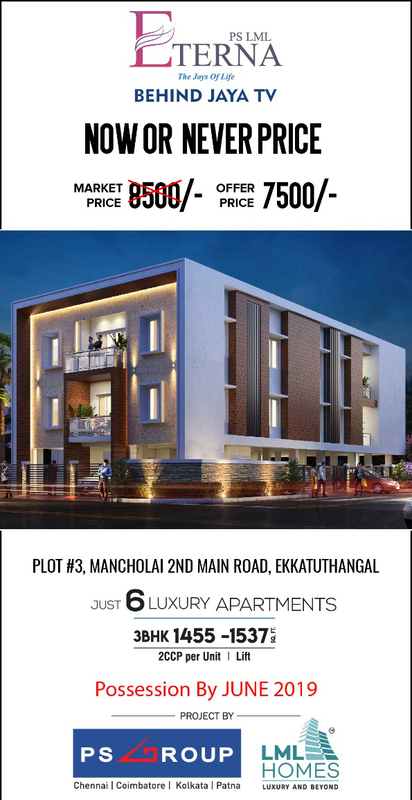 Arun Excello Realty Private Limited offers 3 BHK Independent House in Mahabalipuram positioned in the midst of natural beauty and quick access to the city. Serene Hub, an Individual House promoted by Serene Senior Living is located in Thiruporur. We have developed our villa in one of the rapidly growing area and therefore surrounded by major hospitals, supermarkets, IT industries, Transportation facilities and more. Serene Senior Living offers 1 BHK independent House in Thiruporur developed with ample interiors. Serene Senior Living offers 2 BHK Individual House for sale in Thiruporur provides you complete freedom.